The Abs have been known as one of the areas that people consistently neglect to train to any great degree as it is difficult to see changes in the abs than in other parts of the body say the biceps that a few pushups can already show some effects. The two things that usually make people to abandon these exercises is the fact that there is a lack of variety for the abs (most people know sit ups but don’t even do it correctly) and the lack of motivation when they don’t see changes after a few sessions. However these two instances can be corrected by adding more variety to your exercise repertoire that you can use, and also by learning exercises in their correct form and doing them. Know that changes will take a longer time to show in the Abs but you are well advised to keep doing the exercises. The commitment is sure to pay off in the end. The Mason twist is an exercise that can be used to isolate and train the oblique muscles that are found on the sides of the body. It can also be used in the building and toning of the Abs muscles, and would be an important addition to an exercise regime for training the stomach muscles. It is usually done totally without weights; however a free weight such as a dumbbell can be added to make the exercises more challenging and to elicit a greater response from the muscles. •	Begin the exercise by sitting on the floor or on an exercise mat in a comfortable position. •	Then raise your knees slightly above the ground while you tilt your head slightly to the back so that you are in a dynamic position. If the position is held well, you will already be filling a slight tension on your abdominal muscles and feel the muscles of the legs as they stabilize this you in this position. •	Then clasping your hands in front of you twist yourself and follow through with the motion by bringing yourself one way so that you are looking on one side, and then the next. If you are a beginner you want to start by gently rotating yourself to the right and to the left to get the motion correctly and to feel the muscles contract and relax as you follow the correct form. Then as you gain confidence, you will need to bring your knuckles to touch the floor on your sides as you twist. •	Make sure to keep your hips as stable as possible and not to rotate them as you move your arms from side to side. If the hips rotate as your arms move, it will reduce the effectiveness of the exercise as your oblique muscles will not be worked to the maximum. Thank you so much, buddy. 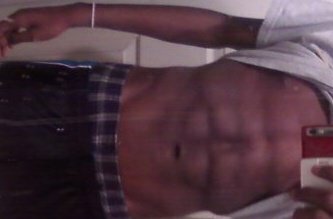 I have been looking for an effective method that can help in building an abs like the one that is shown here. And the way the method is explained is very easy to follow too. Join in and write your own page! It's easy to do. How? Simply click here to return to Bodyweight Exercises.